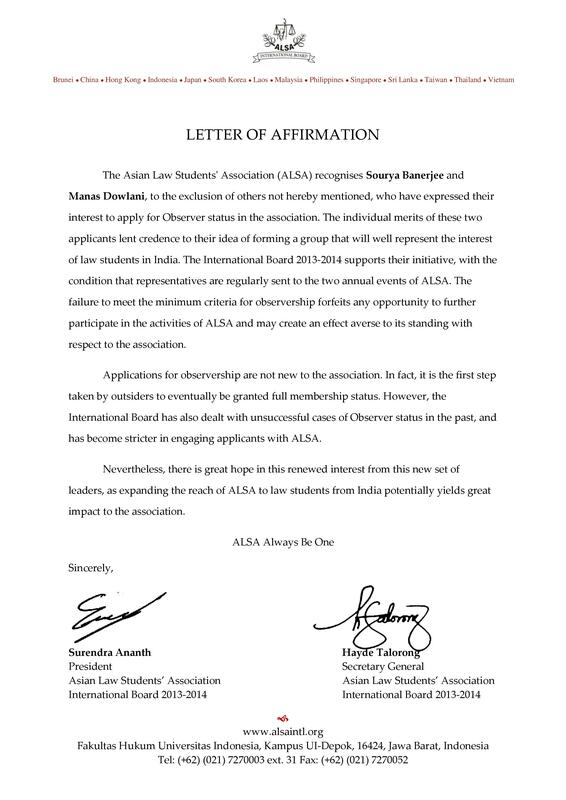 March 25, 2014: Amidst a plethora of activities in the sphere of legal education, Manas Dowlani and Sourya Banerjee have officially received the Letter of Affirmation to start ALSA India National Chapter. With a 12,000 member strong organization composed of students and alumni, Asian Law Students Association has fourteen countries as members. ALSA India’s main goal will be to develop skills and talents of our members to help them in various aspects of their professional career. With the core aims of promoting academic and cross-cultural exchanges between India and Asian law students, ALSA India shall seek to integrate the activities of law students across the country. The chapter will aim at bringing terms with the international scenario and seeks to establish India as a leader among Asian countries in terms of legal education and exposure and increase the overall standard of students. Besides helping Indian students get international exposure with the help of Study Trips and Exchange Programs, ALSA India shall help foreign students get attached and placed in top Indian law firms. ALSA India shall soon be inviting enterprising and adventurous law students, to form local chapters in their respective institutions and strengthen the network.